… Whut? Coal’s goin’ all scary-like! Yeah Coal’s kinda going…nuts. XD Thank you! 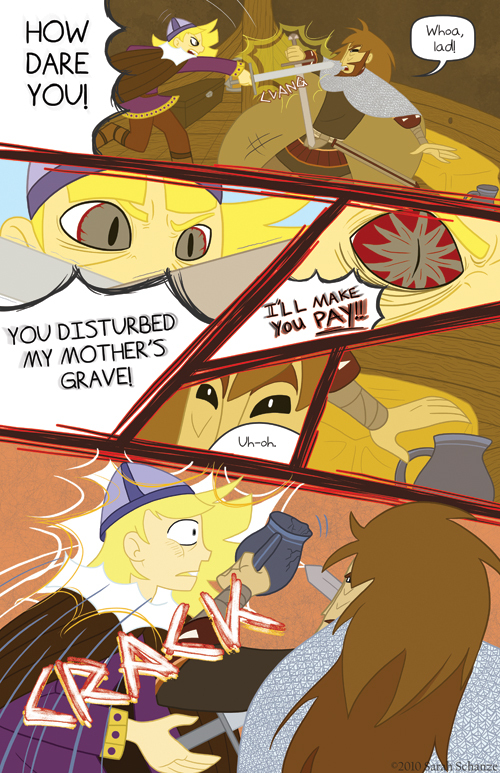 It’s funny, cause in this comic, someone wants to kill Loki (crazy little Berserker Coal!) and in another comic I read, Loki is trying to kill someone! Well, I don’t know about Caitydid, but Loki has his own evil side plot in Gaiman’s Sandman. That’s by Vertigo, but in general Vertigo tends to be less like mainstream DC. Oh yeah, I am reading those, so no spoilers! XD I’m only on volume three. They’re pretty intense stories! But really interesting. For Freyja, I remember stories always talking about her long Golden Hair. Brunettes are interesting (I’m one! ), but I think that her golden hair color is part of what defines her. That is true, and who knows? She might end up being blonde after all. It’s just fun to play around with different designs, especially for characters already so established like mythological figures. Thank you! Freyja is a goddess of love and beauty, she could probably change her hair color whenever she wanted. Tomorrow she might feel like being a redhead! Haha! That is a neat idea! She’s not known as a shapeshifter but she did have that cloak so she probably has more powers than we realize. HAHA! Yeah, luckily Coal didn’t get all Hulky by turning green. That would just be weird! I didn’t make this, I found it on Youtube a couple of days ago. It was a pitch for a cartoon show made by the animator, but it didn’t take because they thought Thor belonged to Marvel. Foolish mortals! Thor belongs to NO ONE! Well, boys’ art will be boys’ art- with their heroine’s well endowed chests, breast-plate bikinis, and stilleto heels that are so useful for fighting in, HA! OH DEAR. my plot-senses are tingling! and yay for my first comment. lul. Wanted to share this with you for quite a while XD and now that I caught a cold and have nothing better to do…. Btw I like your drawing style. Thank you! I think the next page explains more about his mother’s whereabouts. Or maybe the one after…But soon! Awwww, thank you! X3 Either way, I need to read the original Eddas instead of retellings of them. Bet there’s lots of neat things in there to glean from. http://www.cybersamurai.net/Mythology/nordic_gods/LegendsSagas/Edda/ProseEdda/ContentsEnglish.htm#prologuee <– i think this one is quite good. so what does Thistil Mistil Kistil mean????? i’ve tried looking it up in the googles and it all leads back to this site… Also, great work!! i came over from boxer hocke and i’ve read the entire archives and am very much hooked. Also, if the comic name’s like a big plot point to be rebealled up in subsequent chapters please do not answer cuz its really cool when all of the sudden all the pieces of the puzzle fall together. All I can find is references to a “Ledberg stone”, and theories about chanting spells over herbs… “thistle, mistletoe, casket”..? Perhaps something to do with Coal’s appearance or journey? That’s all I’ve got. ; ) Also– first comment for me, and this is one of my favorite web comics! Thank you Threnodi! I’m glad you like the comic. As for the name, you are absolutely right. XD The three words have symbolic meaning to the story, more specifically certain characters. But that’s all I’m going to say! and thats what happens when you push the wrong button. silly loki, moms are offlimits. lots of blood spilt over mom. That’s not natural… or healthy. But then again he’s a viking. I’s an occupational hazard.